Young children just want to play outside, and why not it’s the best place for them. That’s what my mother always told me every young child needs and I believe she was right. It is all too easy to wrap the young eczema sufferer in cotton wool in an attempt to protect them from a flare up. Better for their skin perhaps, but not necessarily better for their overall health. Letting children run and play outside with their friends is important for their physical and emotional development. This development is vital even for the child with eczema. Taking a few extra precautions will help minimize the risk of a flare up whilst your child is outside doing what children do best – having fun. Children love water play but having their hands exposed to water for a prolonged period of time is drying to their delicate skin. Add a few drops of bath oil to the water and swirl it through before they start to play. This way their hands will be moisturized whilst they play. Hours of fun and good for sore eczema hands as well. Small children love to play in the sand but sandpits tend to be harbor germs leaving children more at risk of developing an infection than at the beach. For the safest option keep sand play to the beach where the sand is cleaner and less likely to irritate their delicate skin. The garden is a world full of mystery and adventure. Unfortunately it is also full of pollen and potential allergens. If your child is allergy prone avoid outdoor play when lawns are being mowed and on windy days. Restricting play to paved areas away from allergy filled garden beds and lawns will reduce allergies and eczema flare-ups. If children are to sit on the lawn place a blanket out for them to sit on so the grass will not irritate their skin. Trying to plant a garden that does not have plants most prone to causing allergies will also help. Whilst playing outside is desirable care in the sun is of the utmost importance. Avoid outdoor play during the hottest part of the day. Encourage children to play in shaded areas during hot weather. Sunburn is not only painful but it damages the skin and places it under stress thereby increasing the risk of an eczema outbreak. Consider using SunClear Natural Suncreen to get SPF 30+ protection without irritating the skin. Once outdoors, children can’t help themselves they just have to run at one hundred miles an hour. They are prone to becoming very hot and sweaty. A state that will irritate their skin and may lead to an eczema flare up. Wearing cotton clothing will help to reduce the sweating as cotton is a natural fiber that breathes, enabling good airflow to the skin. Loose fitting clothing that is not restricting will also help to reduce sweating and increase comfort. Remember sweating is fluid lost from the body that needs to be replaced. Encourage your child to drink plenty of fluids whilst playing outside, especially if it is a hot day. This well-known Australian slogan is a must for children playing outdoors. Slip on a shirt, slop on some sunscreen and slap on a hat. Keep as much of the skin covered as possible with light, loose cotton clothing. SunClear Natural Sunscreen is designed to offer suncare protection for people with sensitive skin. It has SPF 30+ protection, and is water resistant. Children with eczema can still play outside if it is cold. They will obviously need extra layers to keep them warm but try to keep cotton against their skin. Remember cotton socks are less likely to irritate the feet or cause sweating. And cotton gloves under woolen mittens will protect their hands from irritation. Avoid outdoor play on windy days as the wind will irritate their dry skin. Above all, good skin care is vital when your child has eczema. By allowing your child to play outside you are exposing them to a huge array of potential allergens that will trigger an eczema flare up. Being vigilant with skin care will help to reduce the risk of a flare up. Moisturize the skin regularly. Wash and re-moisturize the skin if your child becomes dirty or sweaty whilst playing outside. Remove wet clothing (especially socks) as soon as your child comes inside. We all know that trying to stop a child with eczema from scratching is an endless (almost impossible) task. Distraction is one of the best ways to stop the scratching. 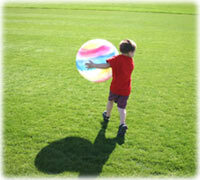 And what better way to distract your child than by keeping them busy playing in the great outdoors. They will be so busy exploring, creating, running and playing that they won’t have time to worry or even think about their itch. Playing in the outdoors has a tendency to tire a child more so than playing indoors. Cover their hands with cotton mitts or socks to stop the scratching in their sleep and send them off to bed. Hopefully they will sleep more soundly from the exertion of a busy day outdoors. Remember outdoors doesn’t have to be a special place that you visit once and a while. Simply walking outside your home is taking your child into the magical world of outside. Visit your local park, beach or playground or simply your own back yard. There is fun to be had for any adventurous young child and your child is just waiting to make some fun of his own. I remember when my children were young, places that I thought weren’t that exciting were often their favorite places. All they needed was a patch of lawn, an old tree or my washing basket and they would play for hours. Many a voyage has been traveled to my clothesline in the great washing basket sailing ship.